We arrived in Alta early in the morning. As it is just around the corner from Honningsvåg, the ship could travel the distance during the night easily. Alta itself has mainly post war architecture. The Nazis burned everything down while retreating from the Russians in WW II. All houses and trees where leveled, except the old wooden church from the 19th century. Norway was invaded by the Nazis to limit access to Swedish ore by Allied Forces. Later, Norway became part of the West Wall against Allied Forces. The Norwegians rebuild the town after the war. At that time, the country was poor, as the oil revenues where still a part of the future. 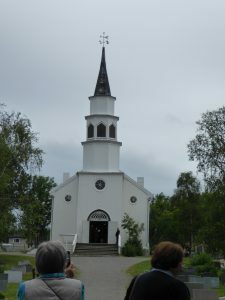 During our trip through Norway, we had the chance to visit towns and villages which were not demolished by those murderers. In comparison you can imagine how much beauty was lost due to Nazi terror. These things always sicken me. Anyway, Alta grew after the war and around the millennium, they decided to build a new kirke which was finished in 2013 costing 12 mio €. The new building is a large concrete structure called North Light Cathedral. The exterior is covered with titan plates (Star Trek anyone? Just the Warp cells are missing) which reflects midsummer sun as well as the famous Northern Lights. The interior is very light and open and quite different to other protestant churches which usually refrain from ornamentation. Have a look at the picture gallery. As said, it is a protestant church, but open to all people. It is a community place where concerts are played, with dance festivals, men with kids meeting, meetings of local groups, etc. You get the picture. The wall is covered with lengthy white U profiles. Initially, they are there to improve the acoustics in the otherwise cone shaped concrete interior. Then they started to place light sources behind the profiles converting the interior in a mythical place. Behind the Jesus (yes there is a Jesus in a protestant church), the wall was painted in sky like light blue and light from above illuminates the statue and the blue wall creating a very uplifting altar room. The organ is placed in midst of the assembly and not stowed away high above, as this is usually the case in churches of the past. All in all very nice; worth another visit with more time to just sit and enjoy. A wonderful small museum on Northern Lights research is located beneath the cathedral. We had not much time to visit that place, but here are some photos of the installation. Early drawings of the Northern Lights where rather crude line drawings or fantastic figures reflecting how complicated it was for the observers back then to grasp the lights just as a beautiful physical phenomenon. Later, the observations became more accurate. I wish, we had more time to really visit the place. It looks like we have to come back and visit the place for a longer time. During our bus shuttling across Alta, we tried to capture – unsuccessfully – stone age drawings on the rocks in the fjord. They older one where more up the hill while newer ones are only 8 meters above sea level. Researchers suggest that this could be due to the general rising of Scandinavia after the last ice age, which is currently still underway. The ice about 3000 m thick pressed Norway down. Since the ice is now gone for the most part, Scandinavia is now lighter and moves up some centimeters every year. We also saw the Alta river with Wiking-like boats resting at its shore. They are used to hunt salmon in salmon season. Before you can go hunting, you need a permit which can be quite expensive, especially for outsiders. The number of fish you can pull out of the water is also limited. Setting a limit became necessary, as fishers started to pull out tons of fish every year endangering the salmon population. We also saw a slate plant. The slate production process is labor intensive making the products expensive. Still they are shipped world wide. After shore leave, we attended coffee time. This time they had Wiener Kaffee as a motive. This included apple strudel, the right apple strudel not these fake strudels with puff pastry. They had Topfen strudel in German quark strudel and in English there is no proper word for the substance quark (similar to curd cheese), so it is cheese strudel as in cheese cake. Of course there were all the other typical clique Austrian pastry things and all (as far as we could sample them) were delicious. I will have to eat salad for the next four month to get back to my usual shape. At that time, we were already heading to Kristiansund taking a path between coastline and islands passing the arctic circle monument a second time. The weather had changed greatly from our tour up to the North, becoming more cloudy and colder — finally. Alta is the largest community in northern Norway and Kristiansund is part of the southern oil and Klippfisk industry. Therefore, we had a full day on sea. We used that time to catch up with our travel log efforts, but first we slept in, skipped breakfast — even the later riser breakfast, making stock without snaps our breakfast together with some tea. Later we washed our clothes in the onboard washing salon on deck three. Deep down in the underbelly of the ship. As this is a German ship. Cash is king. You cannot use your debit card or board id card. No, you have to use Euros. This is super stupid. While you can pay all drinks and extras with your debit card (indirectly, via your room number), you cannot pay your tips to crew and waiters and you cannot get new money on board. Somehow it is expected that you board with some k€ budget in paper money. Checked my calendar. It is 2018 not 1918. Something they really should improve on, as it would make the trip smoother. We also had some massages on board — very relaxing –, got Norwegian apple cake for tea and listened to a harp concert in the evening. Typical for a day at sea. Relaxation and indulgence.